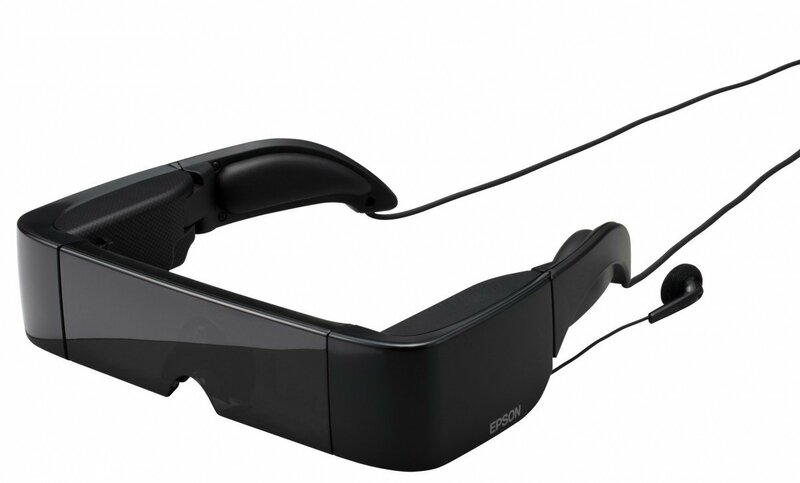 Epson America this morning announced that it's now shipping the Android-powered Moverio BT-100 wearable display. Yes. Android-powered grandma glasses. On your melon. I got to take these guys for a spin last fall in January. They pretty much feel how you'd think they feel -- a bit bulky. Get over that, and having the equivalent of an 80-inch display projected in front of your peepers is a pretty cool, if not entirely practical, idea. With the glasses and earbuds over and in their respective orifices, you hold in your hand a controller (about the size of an old-school, original iPod) that connects to the glasses via a wire. The top half of the controller is a trackpad, for moving a cursor around the heads-up display. There are the usual Android buttons as well, and a directional-pad if that's how you prefer to navigate the menus. There's also a button to toggle between 2D and 3D modes. So how'd it work? Look, it's a novelty, to be sure. But it's also one that was a bit surprising. It takes a minute to get used to the idea of video that close to your eyes. But even the 3D video we watched caused less strain than when we've tried it on smartphones. Another cool effect of the glasses is that you can remove the opaque lenses and actually see through the UI. Not that you're going to want to be walking and playing anytime soon, but the idea is that you lose some of the claustrophobia. The world is still the world. The user interface we saw back in January October was very much in prototype mode, so it was a bit janky, a mix of stock Android and something custom. But it also was very familiar and easy to find our way around. Do you want one of these? It's certainly a fun idea, but you're going to need to have some cash burning a hole in your pocket, as it's going for a suggested retail price of $699. But think of the possibilities. Temple Run. At 80 inches. Angry Birds IN YOUR FACE. Or, you know, (warning: Shameless plug ahead) the all new Android Central Forums app. We've got more pics and video after the break. Edit: Oh, how time blends together. Saw this guy in January, not October. Carry on. Moverio BT-100 offers a unique platform for technology enthusiasts and developers to create new Android-based applications and side-by-side 3D content for this innovative see-through display technology. To help support application and content development for Moverio BT-100, Epson is offering a range of programs for developers residing in the United States. 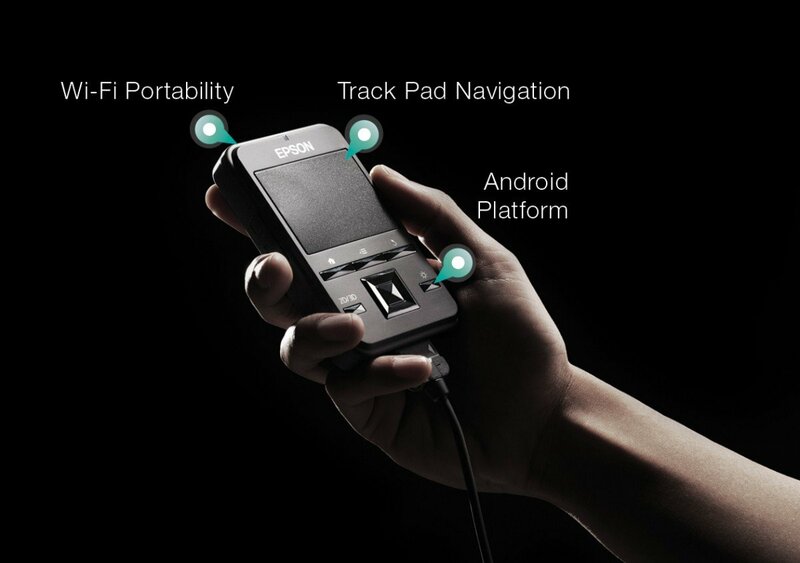 For additional information on the Moverio BT-100 Android developer program, please visit www.epson.com/moverio. Epson is a global imaging and innovation leader dedicated to exceeding the vision of customers worldwide through its compact, energy-saving, high-precision technologies, with a product line-up ranging from printers and 3LCD projectors for enterprise and the home, to sensors and other microdevices. Led by the Japan-based Seiko Epson Corporation, the Epson Group comprises more than 78,000 employees in 99 companies around the world, and is proud of its ongoing contributions to the global environment and the communities in which it operates. To learn more about Epson, please visit: http://global.epson.com. Note: Specifications are subject to change without notice. EPSON is a registered trademark and Moverio is a trademark of Seiko Epson Corporation. Android is a trademark of Google Inc., Dolby and Dolby Mobile are registered trademarks of Dolby Laboratories, Wi-Fi is a registered trademark of Wi-Fi Alliance, and Adobe and Flash are trademarks of Adobe Systems Incorporated. All other product and brand names are trademarks and/or registered trademarks of their respective companies. Epson disclaims any and all rights in these marks.